another list of empties, here we go. Batiste Dry Shampoo Classic: I super hate the smell, like toilet cleaner or something. But quality good. Will buy other scents now. Two Clinique items, first the airbrush concealer which I already repurchased. Then the mild clarifying lotion, which I would have repurchased, but they changed the formula. It now contains witch hazel. My face does not like witch hazel, so I had to go through the hassle of finding a different product. Boo, Clinique. Don’t fix things that ain’t broken! Funnily enough my last toner was by Clinique too, then I decided these things were useless and went years without one. Then I realized toners never worked because they had way too much alcohol content. I found Clinique’s mild clarifying lotion which didn’t have any alcohol, but salicylic acid and was nicely acidic. It worked wonders. Of course they had to change it. 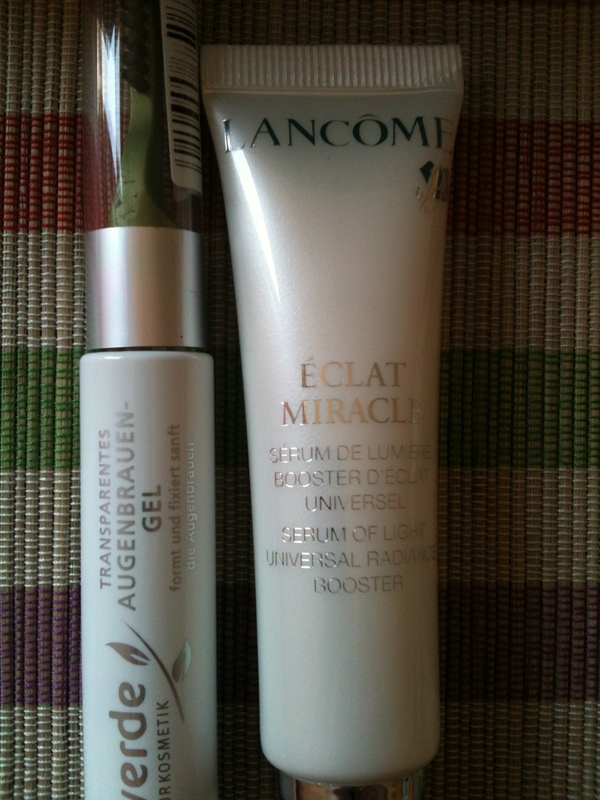 Balea Anti-Falten Augencreme Q 10: So far I liked every Balea eyecream I used. Might repurchase at later date. List of ingredients for eye cream. And last, two items from Rituals. The Ritual of Dao handcream smells great. Dao is my preferred scent of theirs. However, that’s as good as it gets. As a handcream it feels thick and doesn’t sink in properly. But it doesn’t give the skin any moisture. Will not repurchase or try any other of their lines. Especially since this is only 75ml for about € 11? Nope. Might get a Dao linen spray instead. I also have the room scenter sticks. And the second item is a sample of their sensitive skin lotion. This is a regular face cream with lots of aloe vera. I used it at night and it was in fact the best skin care item of Rituals I tried. It gave a good amount of moisture and the skin looked fresh the next day. I will not buy a full size, because firstly I have lots of stuff to use up and then I also prefer for my face cream to pack some power in addition to just moisture (like AHA, BHA, …). List of ingredients for Rituals face cream. Those were my empties of the last month. I think it’s a pretty good amount for a summer month. I don’t know if there will be empties in August, if not I’ll sort through my old makeup and see what needs to be chucked. Alessandro Hand Spa Sun 50: a hand cream with high SPF. It was pretty good, maybe not as nourishing as I need it, but my hands seem to be unusually needy. 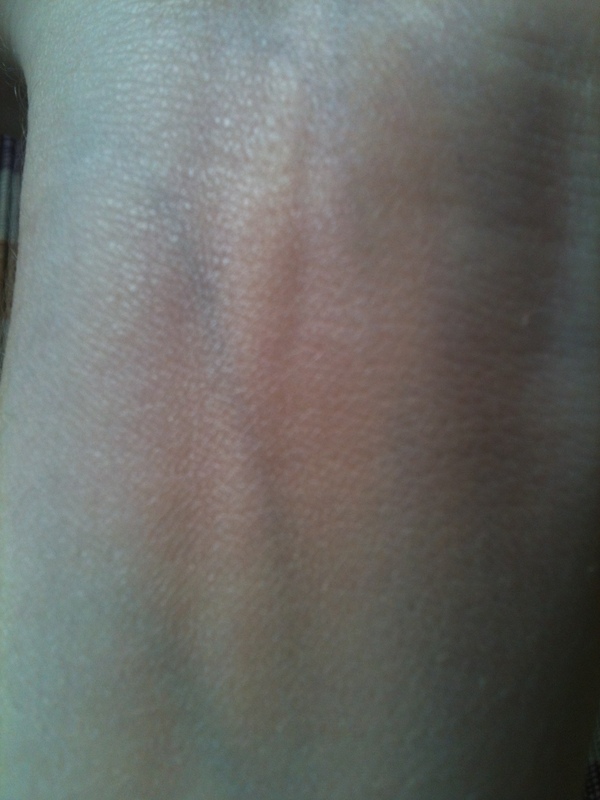 The sun protection has worked very well, the one age spot I have on my hand even got a little lighter. The cream itself leaves a white cast due to the SPF 50. On my face that would annoy me, but on my hands I didn’t care too much. Two items from Nivea: First, the day cream (feuchtigkeitsspendende Tagescreme) with SPF 15 for normal skin. I may have reviewed this before, not entirely sure. It’s a rich face cream. I know it says ‘for normal skin’ and there’s an even richer one for dry skin, but this one is already pretty rich and I would only recommend it for dry skin. It worked well for me during this winter. The sample was surprisingly long lasting; I used this from the december holidays all through january and part of february. The other item is my new favorite shampoo: Pure Impact. I chose it for the short list of ingredients, because I don’t like silicones in my hair and the last few shampoos left my hair overwhelmed. Only at home I realized I had picked a men’s shampoo! Luckily the scent wasn’t cliché man-shampoo smell. In fact it’s very fruity. But not overwhelmingly so. This shampoo does exactly what it promises. It gets you clean in a gentle way. And that’s it. No volume, no extra shine or conditioning. It is a relief, I tell you, after all the gunk women’s shampoo has left in my hair! My hair has never been so soft and managable. I barely use conditioner anymore. You see, my hair is especially unruly and almost impossible to comb. Yes, it is also completely straight and it looks like it’s manageable, but it is not. Until now. I heart this shampoo! Repurchased already. Clinique Airbrush Concealer: Favorite under eye concealer. 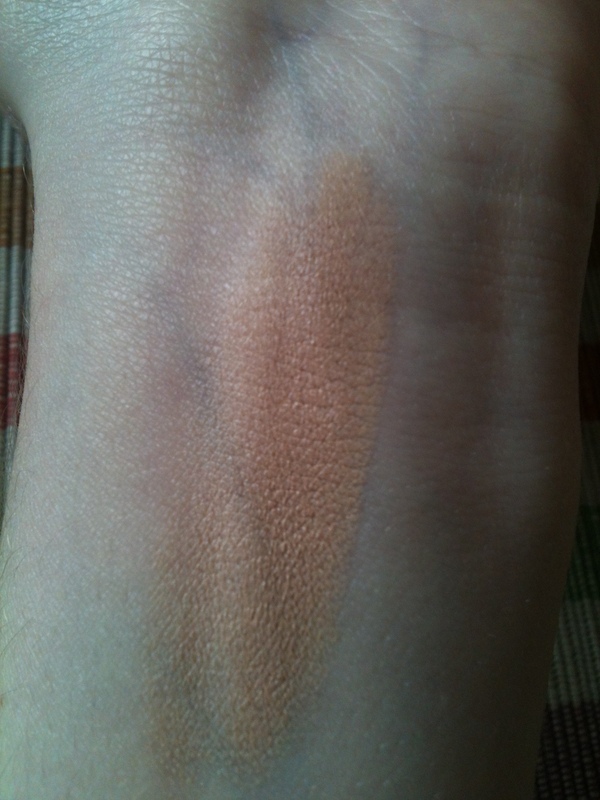 Perfect balance of pigmentation and highlighting. Already repurchased, the package you see here is from my new one. Balea Q10 Anti-Aging Hand Cream: Best hand cream I know. 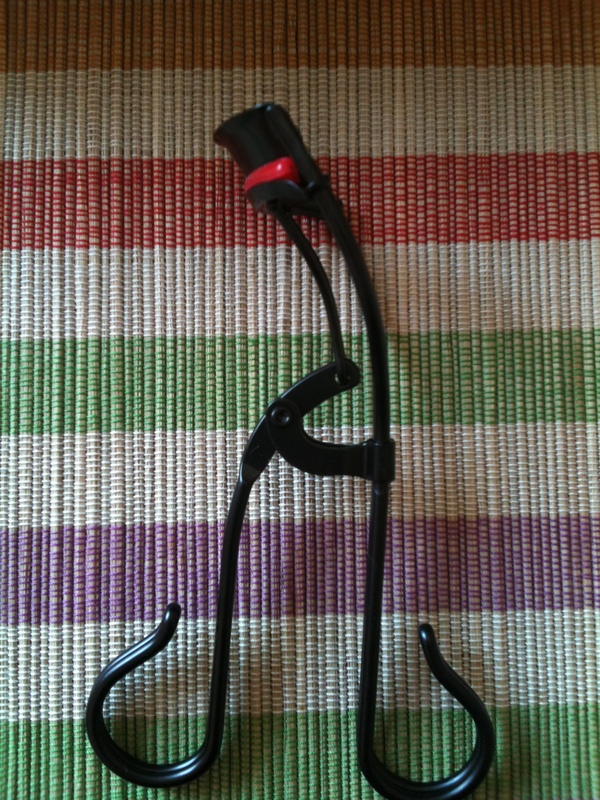 Have not repurchased yet, but will. Comes with SPF 10, that could be higher. Otherwise perfect. La Roche Posay Toleriane Cleansing Milk: I already talked about it here. At the risk of sounding like a broken record, already repurchased. I guess I ran out of a lot of favs last month. A bad pic of the ingredients list. Last item is Lancome‘s La Vie Est Belle EdP. If you want a representation of what this smells like, please watch this video. The smell is highly similar to Armani’s Si, but more rounded and grounded with a deeper streak. That didn’t make me like it more, it made me like it less. It’s like having overeaten. I don’t mean to say it’s a bad perfume, it’s like the epitome of a fruitchouli, a landmark. It’s just not for me. La vie est belle was created by Olivier Polge, Dominique Ropion and Anne Flipo. So we’ve got two eyeshadow duos, one from Nivea and one from Astor, both with barely any color payoff; a taupe cream eyeshadow from Maybelline that was always too dry to apply; three pale lipsticks, all of them with strong frost shimmer (shudder), from s-he, L’Oreal and Astor; an even paler and even frostier lip balm from Balea; and a green concealer from alverde that never worked because it kept sliding off when I put foundation on top. Phew. Sorry, guys, but it’s just not working between us. Bye, bye. I have stolen this tag from apoundofluck like a true villain. 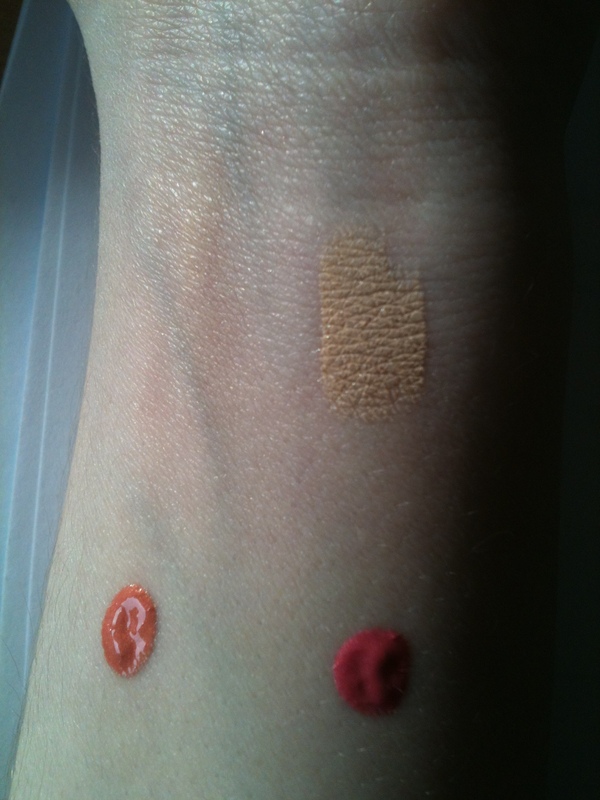 Guerlain Crazy Terracotta. Does it count, since I got it as a present? My second most expensive item is a Bobbi Brown eye palette that I don’t have a picture of on hand. Eyeliner. I love the look of it, but I am very bad at applying and get frustrated in the middle of putting it on, wanting to wipe it off again, soldering on, etc. Symbolic Picture: liquid Eyeliner, here with a thick felt tip. If nail polish brands count, it’s OPI. If we exclude nail polish, it would be Chanel. Contouring. I almost said eyeliner, but I line a lot more than I contour. I prefer bronzing my face to contouring, so I’d rather pop the darker colour on top of my cheekbones than underneath. 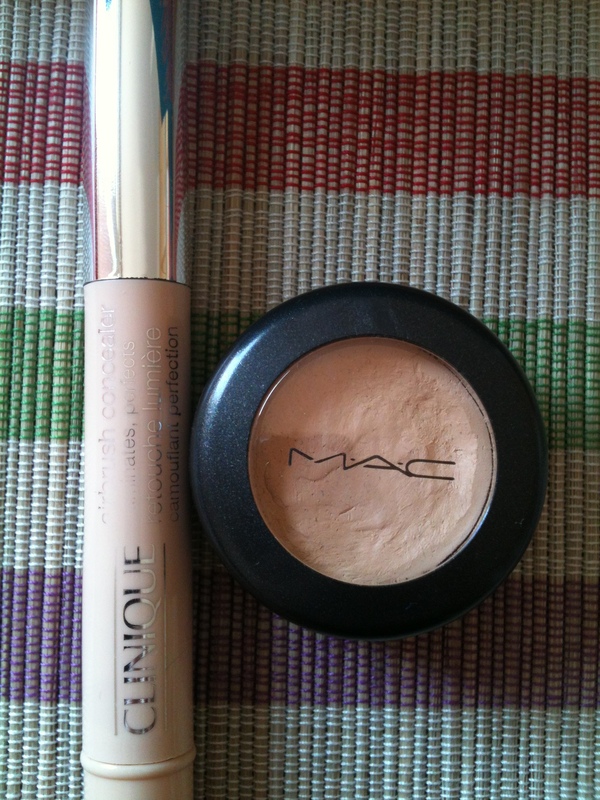 Symbolic picture: the powder duo I use for setting/bronzing rather than setting/contouring. A second place in sloth goes to powdering by the way. I often do not powder at all. Blush. I am very sallow and my cheeks are barely darker than my wrist. As such, blush is essential to make me look alive. A close second would be under eye concealer, third being concealer in general. 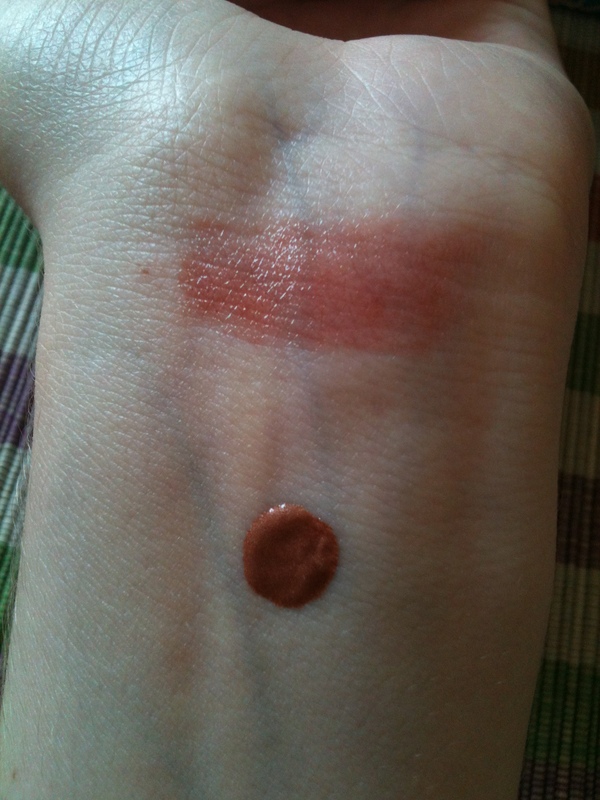 I have to swatch it first, but if it suits me, MAC Viva Glam Rihanna. Or maybe Ruby Woo? Am also lusting after the Chanel Spring 2014, I don’t have anything from it yet. Pictured: Maybelline 14h Stay Lipstick in Non Stop Red, a matte colour without any shimmer. These are my make up sins. What are yours? When the Maybelline Fit Me Anti Shine Stick came out I decided to try it. I’ve been using this for a few weeks now. I have combination skin: oily T-Zone and dry cheeks, so I used this product not on the whole face, only where I get shiny. The color is 120: Classic Ivory/Vanilla. 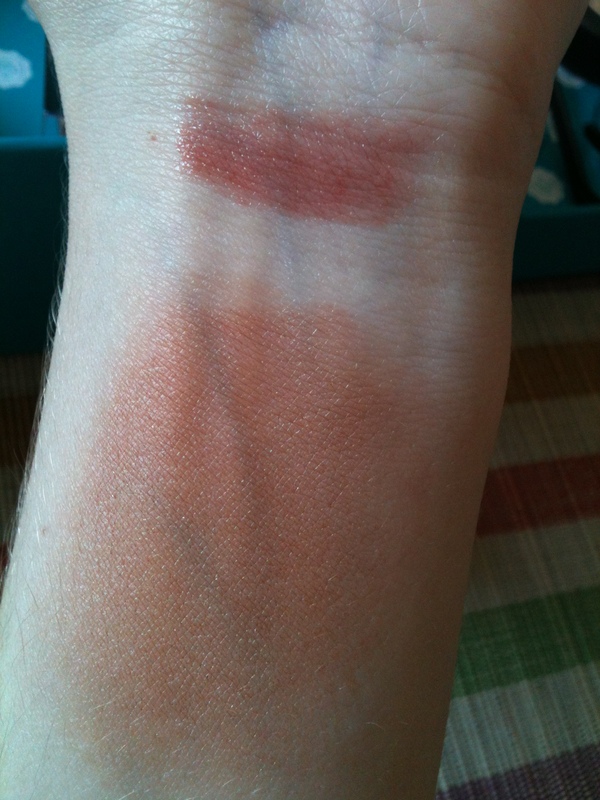 Next to the liquid foundation and the powder it looked darker than their 120. But as you can see there’s a paler dot in the middle. And blended. As my face is not as pale as my inner arm, the color works out surprisingly well. You can easily blend it to light coverage. 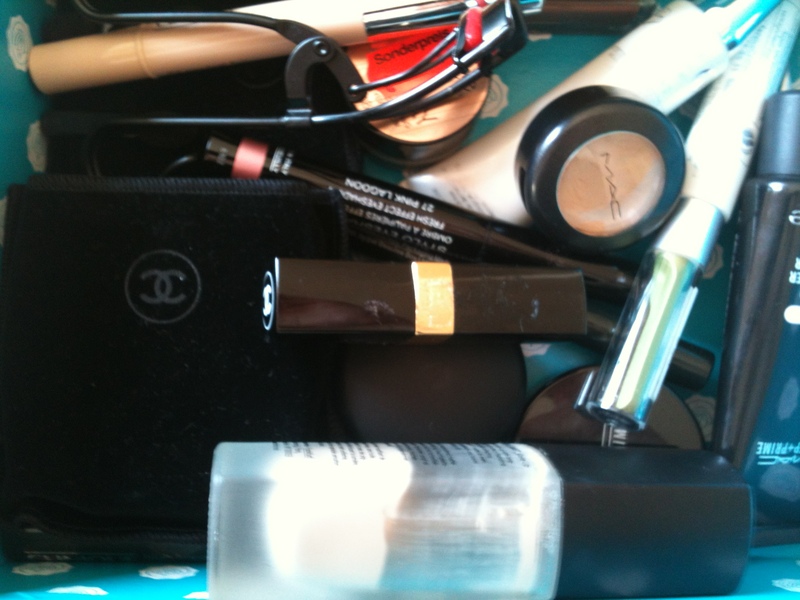 More coverage might be difficult, as it will look like you piled on makeup, which well, you did. You can see in the shot above that it never covers my blue vein completely, so if you’re looking for full coverage, this might not be the thing. For the anti shine promise, I was surprised at my first application: my skin still had shine to it; it was not completely mattified. This is the sort of product that wants to battle oily skin while leaving it dewy. I like that, but then my skin is never a huge oil-fest. Anyway, I was doubtful about the anti-shine thing. Four hours later, my nose still looked he same. No more shine than the original dewyness, yay. It lasts about five to six hours on me, then I see the makeup slipping. 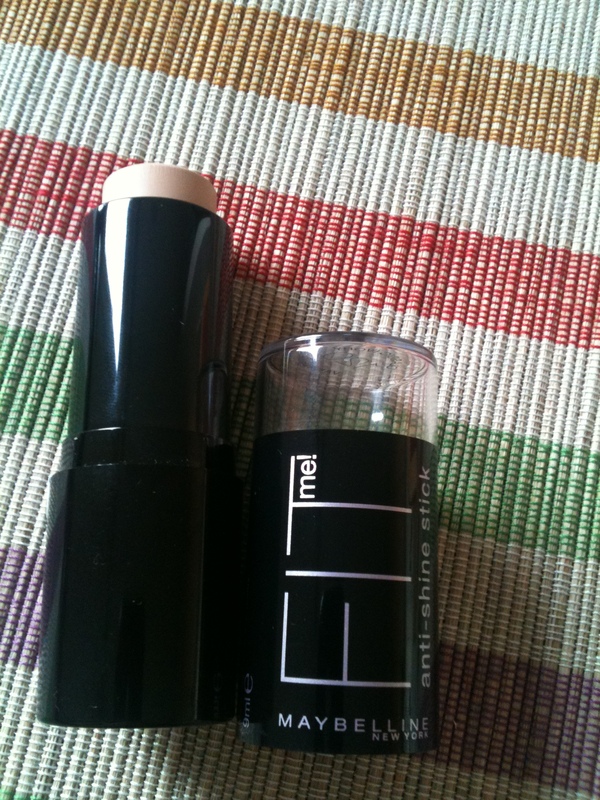 In my opinion the best way to use this stick is not to put it on instead of foundation in the morning. I put it in my purse for touch ups and concealing, especially if I don’t wear any powder that day to keep the dewy finish. Application is fast and it blends seamlessly. 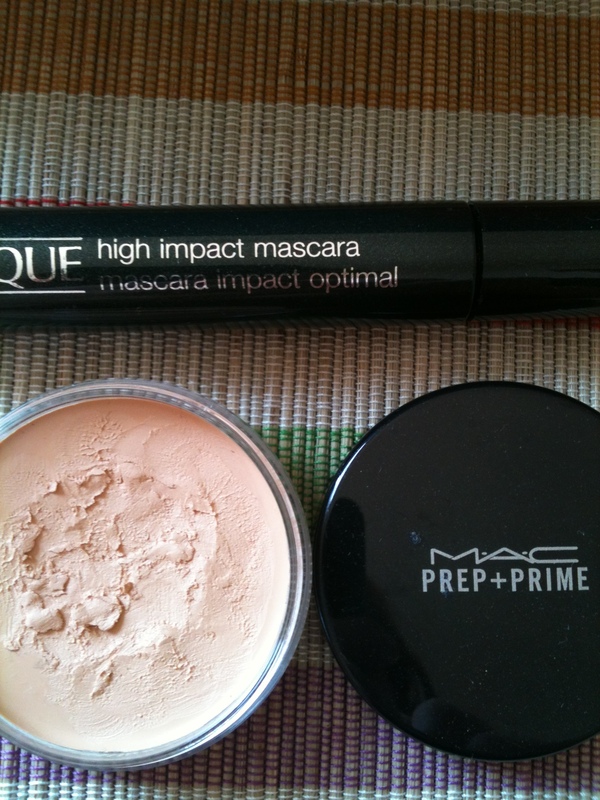 The packaging is light (I don’t want to carry heavy makeup in my purse) and sturdy. I wouldn’t recommend it as normal foundation, as I am doubtful it would last a whole work day, especially on skin that is oilier than mine. 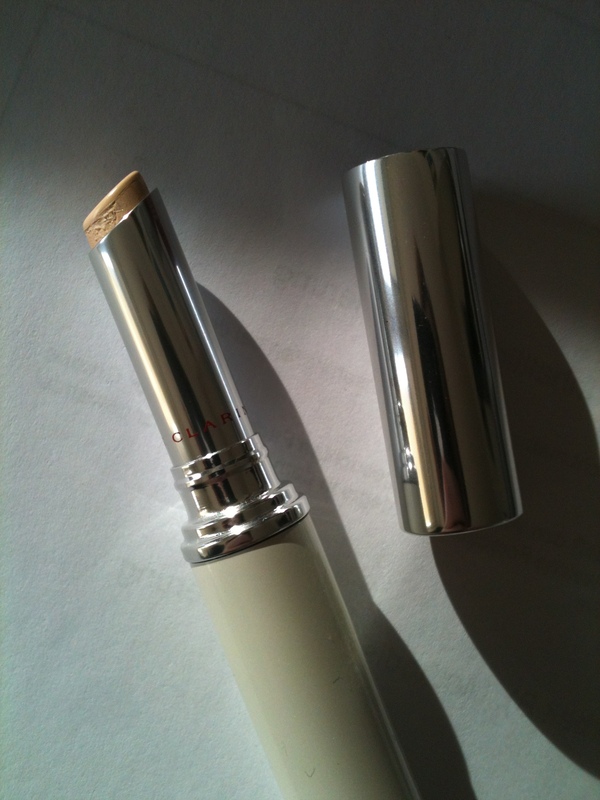 This is the Concealer Stick (Stick Anti-Cernes) by Clarins, shade 01. 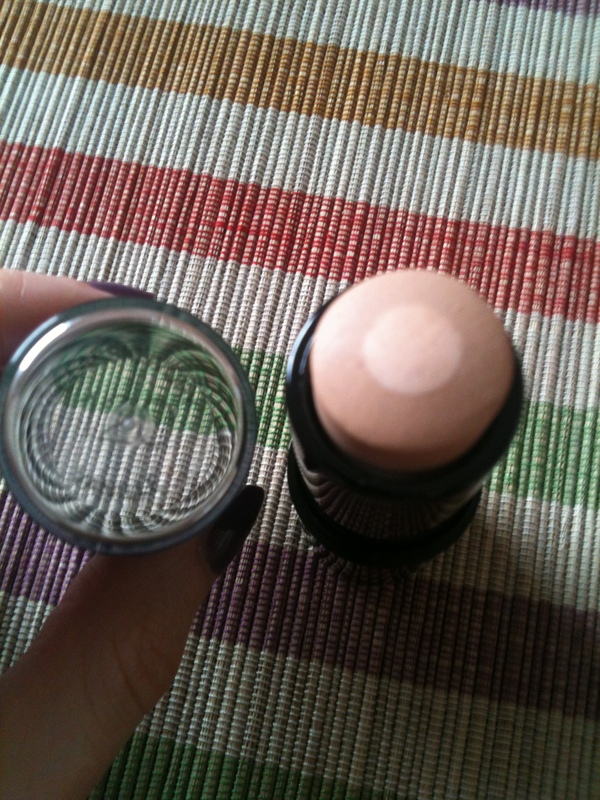 The packaging claims it’s for both under eye concealing and for blemishes. 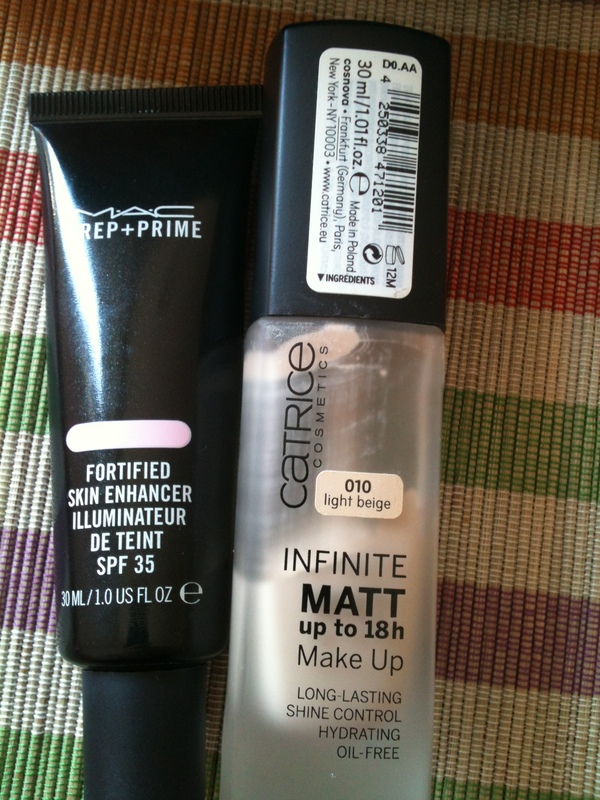 It is creamy, but under the eyes it still ends up in fine creases. I found it to be pretty good for blemishes, though. 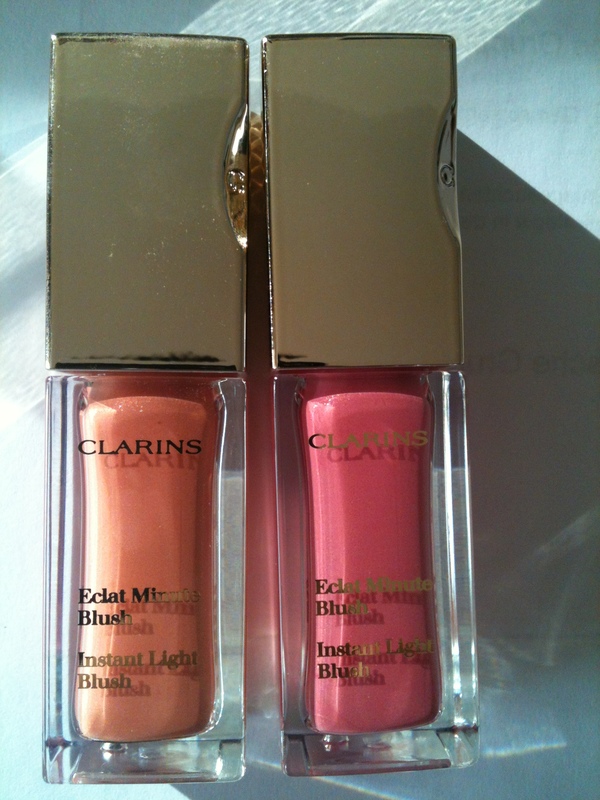 Instant light blush (Eclat Minute Blush), also by Clarins in the colors Coral Tonic and Vitamin Pink. Don’t they just look super yummy? I think these were part of last year’s spring collection and as such probably discontinued. 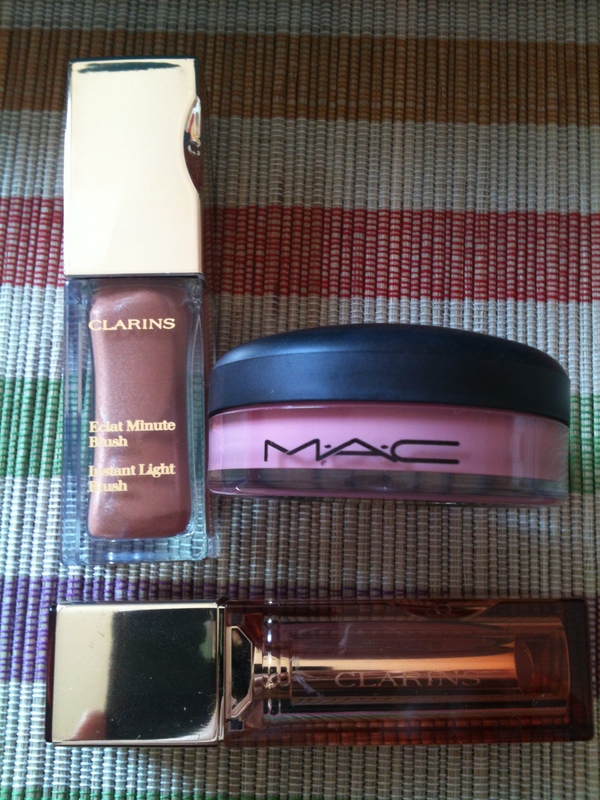 I hope Clarins make more of these because I love them. At the same time I hope they won’t make more, because else I’d have to buy them all! 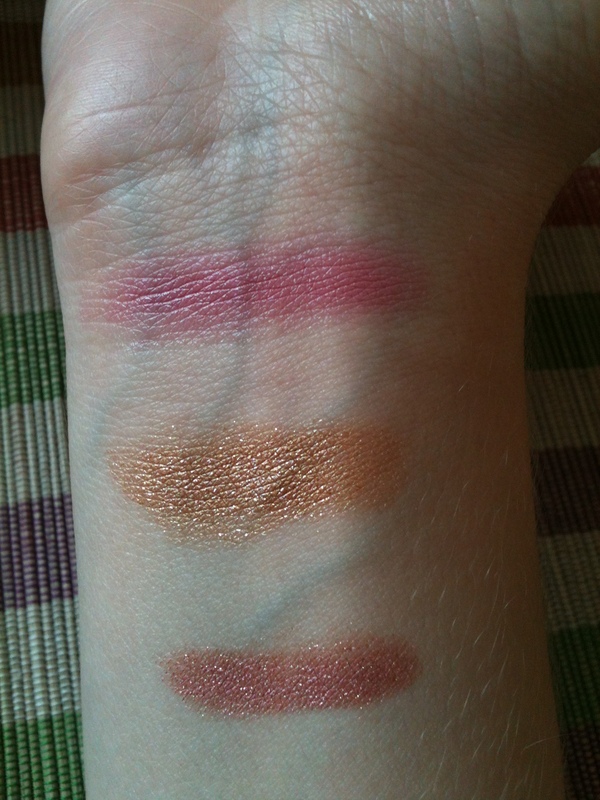 They are liquid blushes and come with a doe foot applicator, much like lip glosses, but bigger. You put a tiny bit on your cheek and then blend with your finger. They are easy to blend, perfect to put on in a hurry. Top left: the concealer worked into the skin, pretty much invisible. 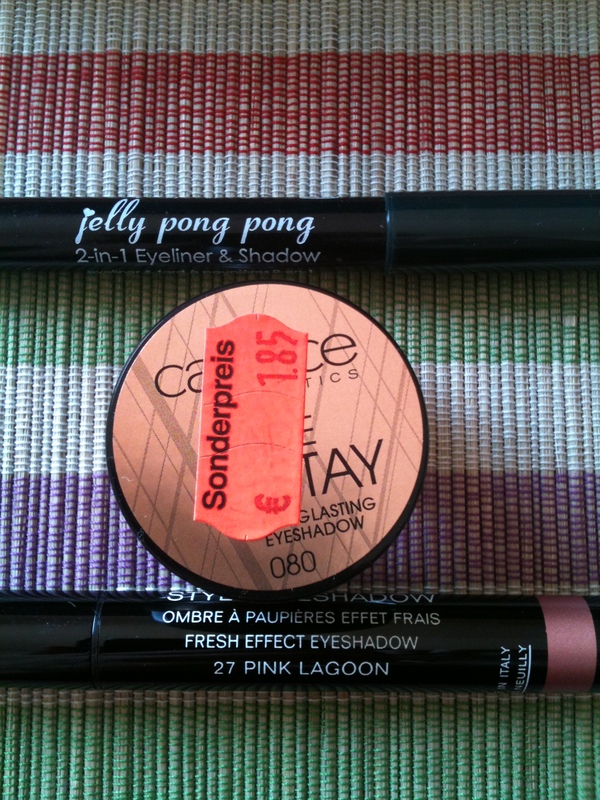 Top right: the concealer as it comes straight from the stick. 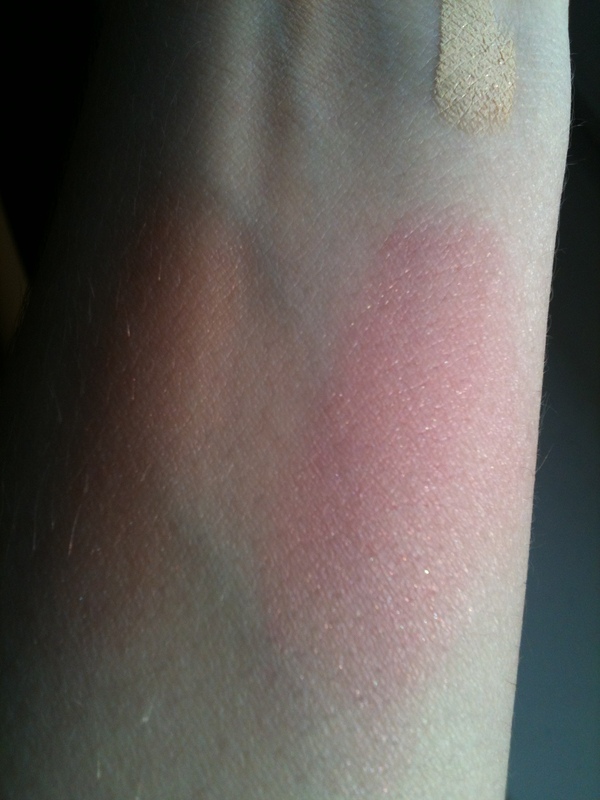 The blushes blended out. 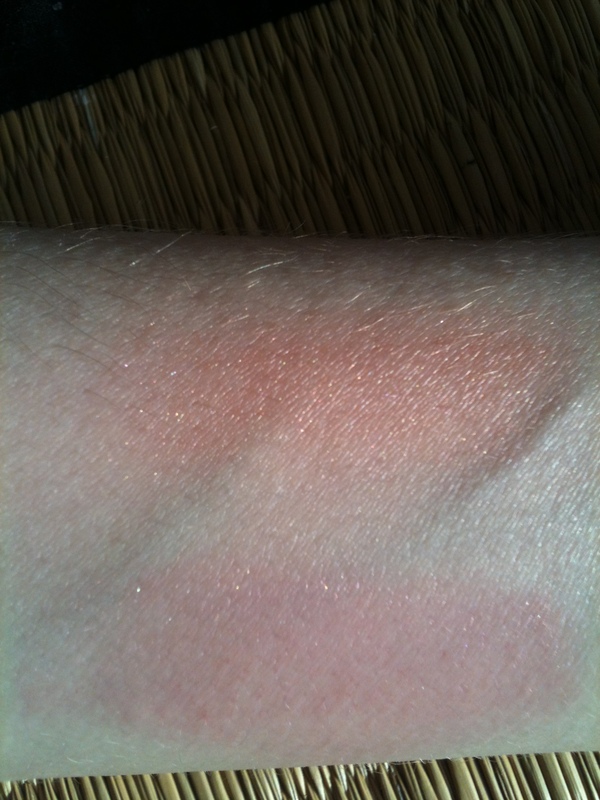 Here the pink looks stronger, but as you can see in the other pic, it depends on where the light is. Pic with me turned around so the sun hits from the other side. I think you can see that both colors are strong on the shimmer. They are blusher/highlighters. I only wear them on gloomy, rainy days; for one because they make me happy, but also because in direct sunlight they make you look a lot like a blushing Edward Cullen. Coming up next: review of Dior’s new BB Cream.